Thank you Integrated Interventions LLC. - Soul River Inc. Thank you Integrated Interventions LLC. Terry Edelmann, Founder and CEO of Integrated Interventions LLC, brings mentoring youth in the community to a whole new, successful, level. His company focuses on mentoring at every level possible, such as: at the youth’s school and college campuses, employment and family home, and reaching youth where they need help on a mental health or emotional level as well. They offer tutoring for education concerns, nutritional guidance and healthy exercise coaches. Integrated Interventions LLC, has develop a specifically tailored plan to assist youth with overcoming obstacles, like developing life structure, how to do chores, how to drive a car, crisis intervention, college success issues, employment or work ethic problems, building positive peer relationships, improving hygiene, family relationship issues, emotional games, mental illness, and acting out behaviors. They are able to build a relationship with youth and help them in any way they need. This company understands today’s culture and knows how to become the extended family that so many youth in our communities desperately need. Terry’s program strongly advocates for youth to use outdoor wellness as a way to build self-awareness. He believes that developing a connection with nature allows young people to heal in a manner that is not treatment-based, because nature is able to supply the opportunity for youth to build trust, develop long standing relationships, connect to a positive outdoor culture, and find fulfillment from the wild wonders and adventure in the outdoors. Soul River aligns itself with the culture of cultivating an awe of nature for inner-city youth. 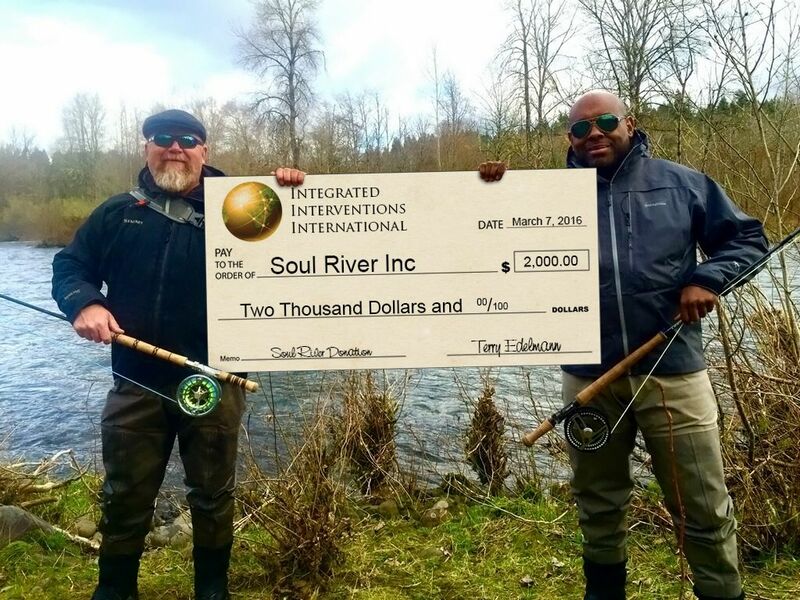 By using wild rivers, U.S. Veterans and volunteer mentors, Soul River focuses on fostering the young minds into an life-long ambassadorship of the outdoors. Fly fishing builds a community spirt, and it develops a valuable friendship between a veteran and a inner city youth for life. Soul river is honored to be in the same affiliate green space with Integrated Interventions, LLC, and values the friendship and the support. As the founder of Soul River Inc., I am honored to receive this check from Terry Edelmann’s amazing mentoring program. And, as executive director, I believe how strong we can walk to help youth if we work together. Let’s keep our boots on the ground with our youth, with a rod in their hands, and encourage our veterans to put the good work in, and lead people to the outdoors, where life changes are bound to happen. Thank you so much, Terry Edelmann, and your wife, Angela Edelmann, for all of your support and friendship.